For all you Star Trek nerds like myself, Startrek.com has just relaunched their website and they have quite an extensive store, and lots of Star Trek info. Best of all, you can watch free episodes of the Original Series (all of them as far as I can tell) and Enterprise (most if not all of them too). Hurry on over to http://www.startrek.com/. As of now, His Robot Girlfriend has been downloaded 30,021 times from its five host sites. I expect to see some distribution numbers coming in from Barnes and Noble and Kobo soon. Remember, you can get your free ebook copy just in time for Read an Ebook Week going on right now. Follow the links to the right. Everything was so symetrical. I had three books published. Three books unpublished but completed. And three works in progess. So what did I go and do? Started another novel. This one is obviously a science fiction novel set in the far future on a spaceship. I’ll give you more details as I get further along– maybe after I finish the first chapter. The second fellow was equally impressive, though not because of height. He was a formidably muscular man with a piercing gaze and a tightly set jaw. His tabard was fringed with gold, and his crest showed a flaming sun within a circle. His bodysuit wasn’t black though, it was tan. I had seen Knights in other colors, Nicohl Messonar for instance, wearing the colors of a teacher. I later learned that tan was the traditional color of Archaeologists. 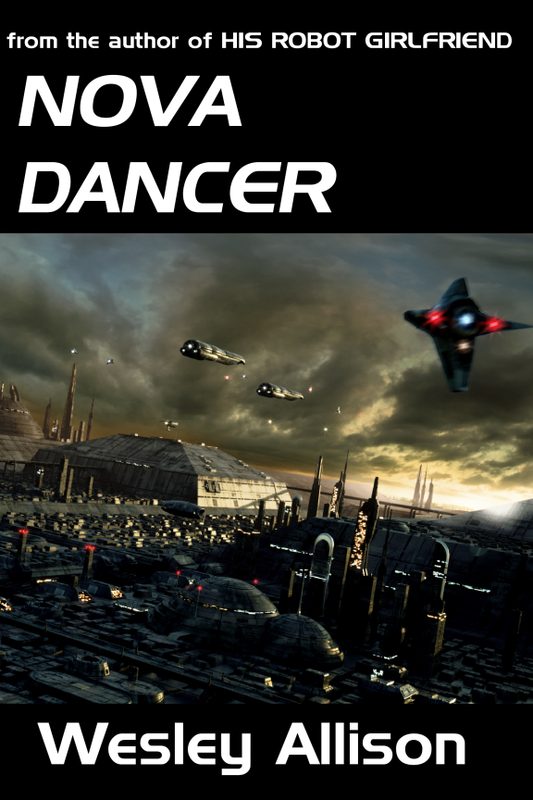 He was Vandan Lorrinos, a highly respected member of the Sun Clan, and a fleet commander. The third person in the room was a woman. She was a breathtakingly beautiful older version of Vena Remontar, or for that matter, of the Princess. She was just over six feet tall, with long straight black hair framing her beautiful dark blue face. She had the same stern look about her that I had found in Nicohl Messonar, and the same ability to seemingly look into a person’s heart. She stared at me with what I thought was a look of more than simple appraisal. She was the mother of Vena Remontar and the aunt of Norar Remontar, and her name was Mindana Remontar. She wore a bodysuit and tabard, but without the crest, indicating she was not a knight. Her bodysuit was dark blue, indicating her profession was that of biologist. The final individual in the room, was the man for whom I had been summoned– the Overlord of the Sun Clan, Nevin Lorrinos. There was no doubt that he was Norar Remontar’s grandfather, for he was tall and handsome, with the same prominent features and the same noble bearing. He wore a great black robe with a golden crest above the heart– crossed swords over a flaming sun, the same crest that Noriandara Remontar had worn. I bowed low to him. I waved to acknowledge her. I could see a kind of fear in her face, even at this distance. I have often jumped into something without thinking, and I resigned myself to the fact that this was probably just such an occasion, though it didn’t quite seem fair that I should bear all of the burden, drawn as I was without my consent. I was compelled beyond my ability to refuse. I saw that Vena Remontar stepped over to speak with the group of templars, no doubt to plead that I was only an ignorant savage. I didn’t watch to see the outcome, but turned and made my way into the wilderness. I had walked a mile or more, when I turned to look back. The gate was no longer visible, lying beyond a small hill that I had crossed without really thinking about it. In fact, I could no longer see the city in any direction, though I knew that it lay all around me. I didn’t know how large the Garden of Souls was, but there was a small mountain rising up ahead of me, so I headed toward it. I know it must have been a number of miles, but it seemed that I crossed the distance and climbed over the mountain, in no time at all. When I reached the summit I looked down into a small valley surrounding a blue pool. It was not the most beautiful valley that I had ever seen, but is seemed a nice place to await my soul. I was unsure as to just what I was really waiting for. I knew that the Amatharians met their souls here, but just what was a soul? I could only think of the soul as a mystical force, as in the Judeo-Christian sense of the word, but I knew that the Amatharian soul was different. For one thing, not everyone had one. For another, I knew there was some physical manifestation. There was a force of some kind which made the remiant’s sword glow and cut through anything. I had seen it myself. I sat down on the ground, below a small tree, beside the blue pool. Try as I might, I just couldn’t feel fearful about what I had done. Any sane person would, I suppose. I had stepped into a life or death situation without any thought at all. If I came out without a soul I would be disgraced and would be forced to leave the only friends that I knew in this world. If I didn’t come out at all, I would die where I sat. Still, I wasn’t sad or afraid or unhappy. I was fine. At least that’s how I remember it. A slight breeze picked up, and blew low clouds in to block out the sun. I leaned on my right hand, and felt something smooth beneath my palm. Looking down to see what it was, I saw a partially buried skull grinning back at me. I slowly looked around, and for the first time noticed that the ground around the little pool was littered with bones, some with decomposing flesh still hanging upon them. Here were the remains of those who failed to find their souls. I suddenly felt my stomach sink and my loins tighten. Here was the fear that had failed to manifest itself up until this point. I should say two fears, for there were two distinct emotions, and I didn’t know which was causing me the most anxiety– the fear that I would die here, or the fear that I would prove unworthy and drag myself from the garden in disgrace. These thoughts were still occupying my mind when I noticed a small flame directly in front of me. Something on the ground had caught fire. The fire was the size one would expect from a freshly filled cigarette lighter or five or six wood matches lit together, though I couldn’t quite tell what was on fire. Nothing seemed to be consumed by the blaze. Then the little fire hopped toward me, leaving nothing scorched in its wake, and stopped within arms reach. At the same time, I felt a tickling sensation on the surface of my scalp. I had the impression of thinking a thought, or smelling a smell, or reading a word which I could not quite identify. “You are my soul,” I said, a feeling of awe coming over me. The little flame burned and I continued to have the tickling sensation in my head, which continued until it became an itching and then an aching. In the very first version of “Princess of Amathar”, Alexander was transported to the world of Ecos, where he met a family of Amatharians living in a homestead far away from Amathar. In that version of the story, the daughter of the family was captured by Zoasians, and Alexander set off to rescue her. When I revised the story, I had Alexander first come into contact with a creature called a Malagor, who took him in and became his companion. 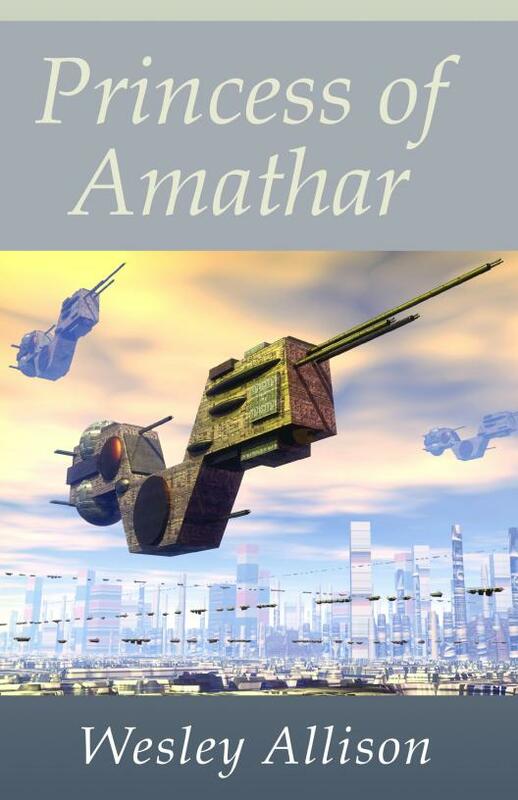 In the final version of the story, Alexander and Malagor stumble upon a battle between Amatharians and Zoasians and see the Amatharian Princess (hence the title) captured, and must rescue her. Malagor resembles a sort of cross between a wolf and a baboon. He is furry, rather stoop-shouldered, and has a long dewclaw upon his thumb. Malagor is the name of the species (in Amatharian), and as Alexander can’t pronounce his name, he calls his companion Malagor. The Malagor lived in a pragmatic pack-like society, with inter-species trade the main source of the economy, at least until they were killed by the Zoasians. As I said this, I swung down. I knew that were we really engaged in battle, her sword would have glowed with power, and sliced through the mundane metal of my own, but for now, the soul was asleep, and we were on equal terms. Actually, I had an advantage of superior strength. She blocked my swing, but was unprepared for the added power, and it knocked her from her feet. Without hesitation, she swung toward my knees. I jumped up, and the blade passed harmlessly below me. The young knight rolled to her feet. I could see by the half smile on her lips that she was enjoying herself. With a flick of her left wrist so quick that I almost didn’t see it, she whipped her short sword from its sheath and grasped it like a dagger. I chopped down with my blade in an attempt to catch her off balance, but she wasn’t off balance. She blocked my blow with the shorter blade and began to attack with the longer. Then she attacked with both swords, forcing me to defend, and I am sure, hoping to wear me down. Unable to attack for the moment, I began to leap quickly to either side, and then to the back, forcing her to chase me. I knew that it was I who would be able to wear her down first, and after several dozen parries, I could see in her eyes that she was coming to the same realization. Here was the advantage I needed. I rained a series of blows at her head, then swung with power at her side. Like she had before, Vena Remontar spun around with her back to me and swung her sword, tip down, outward to meet mine. I expected to have a quick shot at her exposed back and left side, but even as she blocked my attack, she had with her left hand, driven her short sword straight back under her arm, and into my stomach. “Umph!” I grunted in surprise. I expected that I had been cut through, but the tip of her sword merely pricked my skin. Vena Remontar wiped the tiny drop of blood from her sword tip onto her tabard, then sheathed her sword. With the drawing of first blood, the contest was over. “Still, you defeated me,” I said, still holding a hand over my wound.